View the Labels/SDS information for Posterity Fungicide. 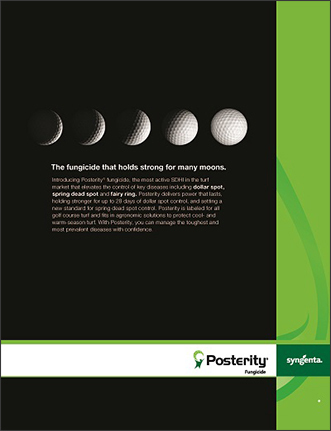 Posterity® fungicide is the most active SDHI fungicide for the turf market. Providing power that lasts, Posterity holds stronger for up to 28 days of dollar spot control and delivers consistent spring dead spot control. Posterity is labeled for all golf course turf and fits in agronomic solutions to protect cool- and warm-season turf. Start the season strong with an early application of Posterity prior to conditions favoring dollar spot, such as: temperatures between 59°F and 86°F, continuous high humidity, cool nights and intense dews. For continued protection from late summer through fall, turn to Posterity for curative and extended preventive applications. Posterity is excellent for fall treatments that hold strong until winter. Treatments applied to Miniverde® Bermudagrass on Sept. 22 and Oct. 20, 2016. Data collected April 28, 2017.Source: Bruce Martin, Clemson University, 2017. Applications made on October 13 and November 10, 2017 on Champion Bermudagrass. Photos taken: May 4, 2018. Source: Bruce Martin, Clemson University. Source: Bruce Clarke, Rutgers University, 2017. Trial was conducted in an area that had severe fairy ring in 2016. Four applications were made in 2017 on a 28-day interval - May 2, May 30, June 27, and July 25. The most active SDHI in the turf market delivers power, spectrum, and endurance for enhanced fungicide performance. Supported by years of research, Posterity, with its active ingredient Adepidyn®, brings an innovative solution to the turf market. Dr. Jim Kerns, Ph.D., associate professor and extension specialist, N.C. State University, discusses spring dead spot development and prevalence. He also details how Posterity® fungicide provided consistent spring dead spot control in his trials. Dr. Jim Kerns, Ph.D., associate professor and extension specialist, N.C. State University, shares recommendations for incorporating Posterity® fungicide into an agronomic program. 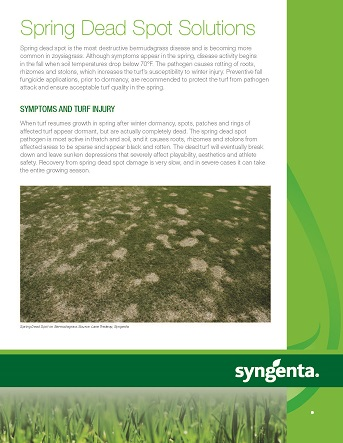 Learn how Posterity can control dollar spot and spring dead spot on golf course turf. Posterity®, Greencast® is a trademark of a Syngenta Group Company.